The MiR200 robot’s high payload capabilities, ease-of-use, and cleanroom compliance smooth the production flow for surgical instrument manufacturer Argon Medical Devices. 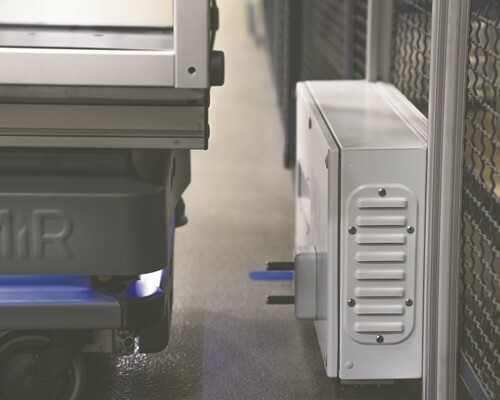 The robot allows skilled workers to stay gowned for cleanroom work, improving productivity and saving the equivalent of one full headcount from material transportation tasks. Argon Medical Devices makes specialty surgical needles and catheters in its manufacturing facility in Wheeling, IL, just outside of Chicago. The company has turned to collaborative automation to help it compete in this high-cost labor market, while preserving jobs for its skilled, long-term employees. According to Argon Senior Engineering Manager Kevin Hess, material handling was an obvious target for cost savings, and Mobile Industrial Robots (MiR) offered the ideal solution. Two-thirds of Argon’s 85,000 square-foot plant is ISO Class 8 cleanrooms where surgical instruments are manufactured and packaged. Cleanroom employees must wear gowns, hair nets, and safety goggles, and remove them any time they’re outside of the cleanroom transfer area. But gowning and ungowning wasted valuable time when employees needed to transfer material to the warehouse multiple times during the day. Instead, material was batched for a few pick-up times per shift, which impacted production flow. 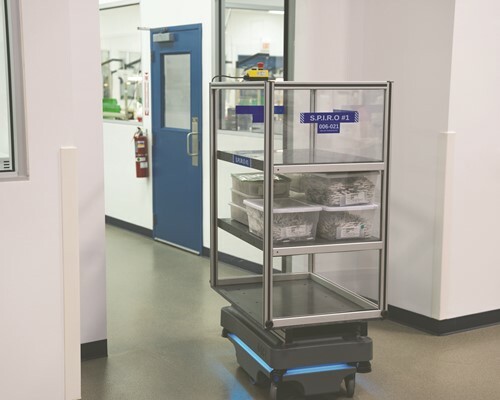 With the MiR200 robot, productivity has improved dramatically by allowing warehouse employees to stage materials, load the robot with material for multiple departments, and send it on missions to deliver the material automatically. Hess was impressed by the features that MiR offers, especially its ease of deployment that doesn’t require the expensive and disruptive installation of lines or sensors in the facility floor that other material transport robots require. For Argon, the MiR200 was an easy choice because of the weight of materials to transport. Even with payloads up to 400 pounds (180 kg), Argon’s staff has been impressed by the robot’s stability and safety. As soon as the MiR200 arrived at the Argon facility, Hess connected to it with his phone through the robot’s intuitive web interface and was able to drive the robot around the office. Within a week of delivery, the new robot was deployed on the production floor, running missions between the cleanrooms and the warehouse. Employees quickly became comfortable using tablets to choose missions for the robot using its easy-to-use interface. Hess’s objective for the MiR robot was to take costs out of the company’s processes and make work more efficient for operators and warehouse staff. The company has redeployed personnel who were using their time moving product back and forth to more valuable activities. That time was the equivalent of one full-time employee, which gives Argon a return on investment of just one year. Just a few months after installing his first MiR200 robot, Hess is already looking at additional opportunities in the Wheeling facility for a second robot and using the MiRFleet fleet management software for even greater efficiency. Hess is also talking to his colleagues at the Argon facility in Athens, Texas, which has a much larger footprint than the Wheeling plant and about 25 warehouse personnel that are responsible for material movement.